After a five-season hiatus, Kalev Cramo Tallinn returns to the Eurocup to wave the flag for Estonian basketball. The club has assumed the mantle of the dominant force in its country with three consecutive Estonian League titles, while becoming a serious challenger in the Baltic League and a regular participant in the VTB United League. Founded in 1998, the club should not be mistaken with Kalev Tallinn, a seven-time Estonian League champion that also won the last-ever Soviet Union league in 1991 and was a regular in European competitions throughout the 1990s. Kalev Cramo may not have its tradition, but it’s working on it. Established under the name Ehitustooriist, the team entered the top Estonian League already in its debut season, though it finished last in both 1999 and 2000 with a combined record of 2-53. That did not stop the club, which had the goal of developing young talent to create one of the top Baltic teams. Ehitustooriist struggled in the Estonian League for three more years, but things changed by the 2004-05 season, when it finished fifth overall with a respectable 13-20 record. A year later, the club's hard work paid off in the most incredible way. Coached by legendary shooter Aivar Kuusmaa and with players like James Williams, Howard Frier, Gert Dorbek and Rait Keerles, Ehitustooriist won its first Estonian League title by downing TU/Rock in a thrilling seven-game finals that went down to the final play. Soon after the club changed its name to BC Kalev Cramo and added a second Estonian League title in 2006, when it also made its European competitions debut in the FIBA EuroCup. Kalev debuted in the ULEB Cup in 2007-08 and won three of its first four games before fading and failing to reach the next stage. However it reached the Estonian finals in both 2007 and 2008 and then led by head coach Nenad Vucinic, finals MVP Kristjan Kangur and playmaker John Linehan celebrated another league championship in 2009. 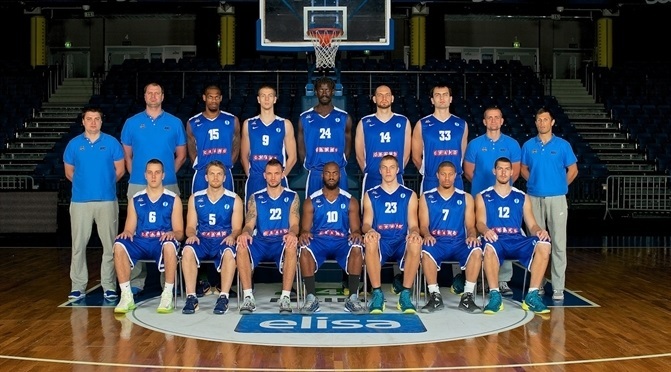 The last three seasons are when Kalev has cemented its place as Estonia’s top team. In addition to three-peating as Estonian champion, Frank Elegar and Bamba Fall dominated inside as Kalev Cramo raced to a third place finish in the 2013 Baltic League. Now fully established as force in its country and region, Kalev Cramo takes aim on the rest of Europe this year.